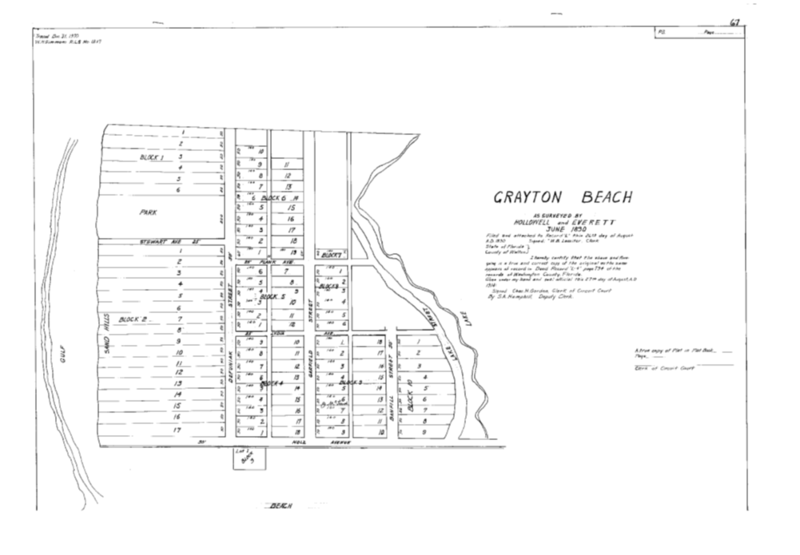 Also known as the “Plan of Town of Freeport” in Walton County, Fla. This is a certified copy that was obtained from the public records at the Walton County courthouse. The document is currently not recorded in any of the official records, however the document is located in the courthouse and regarded as an (unofficial) official document that you many purchase certified copies of. This Survey is referenced in hundreds of Deeds today, and heavily relied on by the City of Freeport and Walton County. It is used by Walton County to produce the County Tax Map of Section 15. The “survey” shows one square mile of Section 15. Note the point where Lafayette creek and Four mile creek join is shown as well south of the section line. This is not the same location shown on the original Plat or indicated in the Official Field notes.The effect of this survey is that the whole of Section 15 has moved north. There is a scale on the survey showing 1 inch equals 200 feet, so it is possible to calculate that this northern movement amounts to about a 400 hundred foot difference on the location of the section line. [Plus or minus] There is no information explaining how this survey was connected to the original TRS Grid when it was made, and no reference monuments that identify the section corners. This Survey is signed by Mr. W. J. Stephens who indicates that he is a Duputy (Deputy) US Surveyor. This would suggest that this survey was an official “dependent” re-survey of this section done for the Government Land Office. Research on the "Duputy" shows that he and his survey equipment were approved for field work that could potentially be contracted by the Government Land Office, however he refused the only contract offered to survey a township citing the need for more money to perform the task. Mr. Stephens was not offered another opportunity by the GLO, and never had a job as an official US Deputy Surveyor. He misspells the word Deputy, in an action that could be described as a “Freudian Slip” as he wrote “Duputy” and the document went into the files of public record. Walton County does not have copies of the original Federal surveys, the surveys that founded the County, or any of the surveys done by the County Surveyors in the public records, but it sure has this survey. There is a blue cloth unsigned version in the unrecorded plats file at the Tax Appraiser’s office. There is a framed paper version that hung on the office wall of the current Tax Appraiser with a signature of “W.J. Stephens” that appears to have different handwriting than the version of the survey on file at the Clerk of Court’s office. There is a copy of this survey on file at the Freeport City Hall in addition to the copy at the Clerk of Courts office in DeFuniak Springs. This survey is referenced in deeds and on other surveys that claim it is found in Plat Book 2 page 67 of the official records in the Clerk of Courts office. A DOT survey done by the State of Florida references the Plat Book and Page as well. At some point in history, this survey appears to be filed into the public records, and then removed later. The document below is the current survey found in Plat Book 2 page 67 of an unrelated portion of land in another part of Walton County.